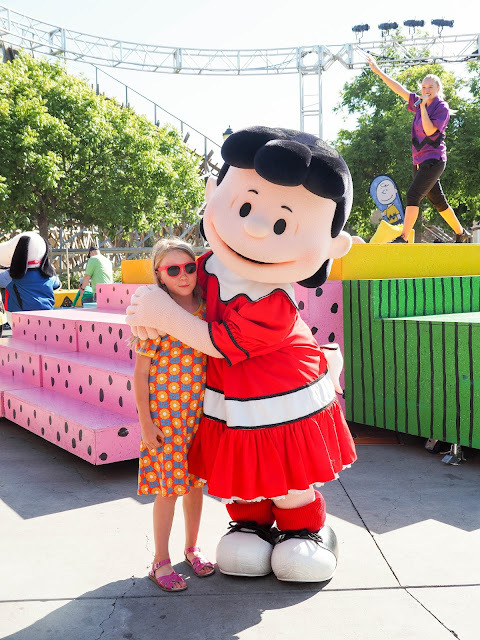 Back in June, when Summer was only just beginning, we took a trip south to San Jose for a day of amusement park fun at California's Great America. 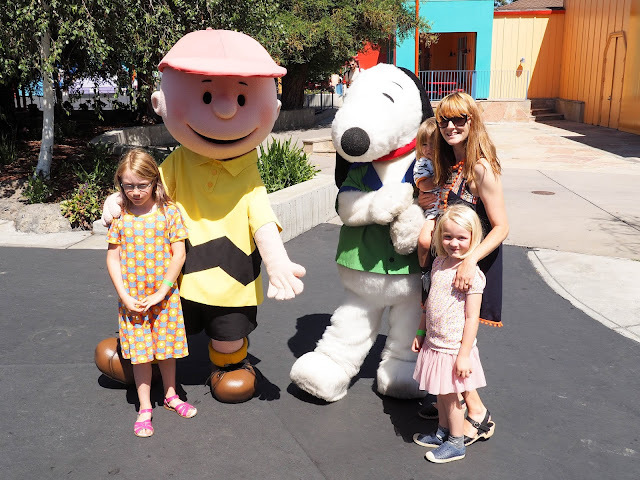 This was our first time visiting an amusement park here (other than Disneyland and Legoland), and despite their reservations about roller coasters and fast moving rides, the kids had a blast! I've kind of avoided taking the kids to an amusement park up until now. They're really just not my thing, and given that the girls aren't fond of scary rides (even if they're not actually really scary!) it hasn't seemed worth the expense or effort involved in getting there. But as it turned out, Kim's work held their annual "Summer picnic" at California's Great America this year and we had the entire park to ourselves, and for free, so it was the perfect introduction to a day at an amusement park. 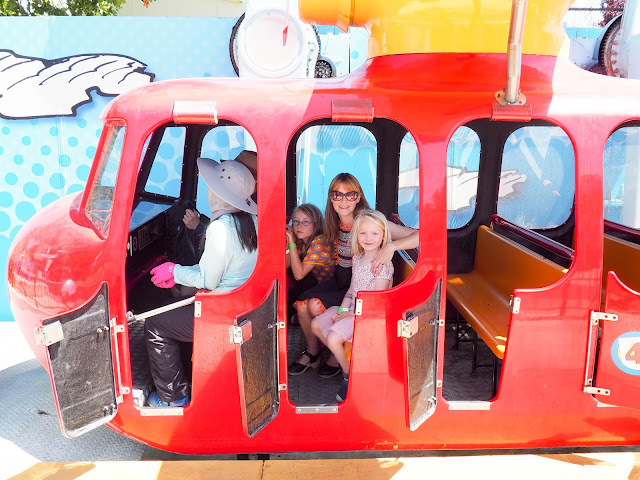 As I mentioned earlier, my girls aren't into fast rides or roller coasters, so after grabbing a bite to eat we hopped aboard the Delta Flyer gondola ride and made our way across the park to Planet Snoopy, the park's family friendly area with less thrilling rides. 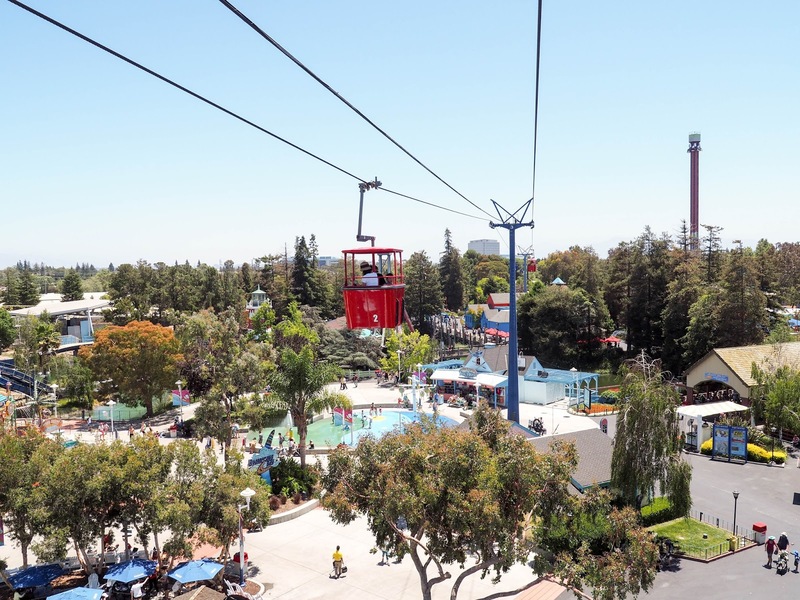 From the Delta Flyer we had a great view over the park - and I had a great view of two little girls who thought that even this was too thrilling a ride! Before I share the fun from Planet Snoopy I just have to show you that bite to eat that we stopped for. Being an amusement park, the food on offer was very much amusement park food. 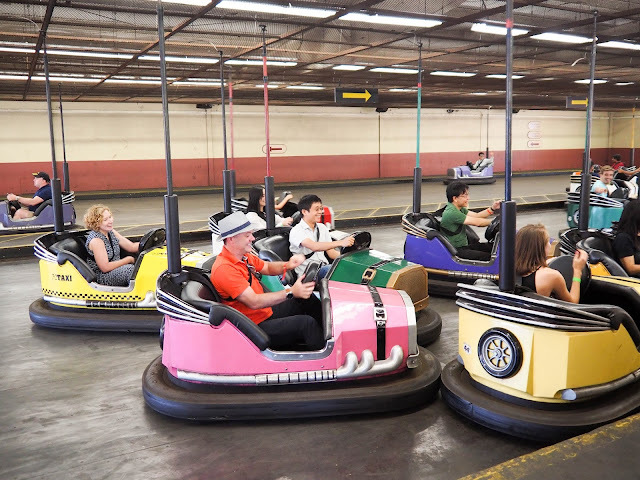 You know, the sort of stuff that you wouldn't normally consider eating anywhere else but suddenly becomes super appetizing when you're at a carnival or amusement park? The hot dogs, popcorn and giant sodas were all relatively healthy compared to the snack that the girls were all excited to try. 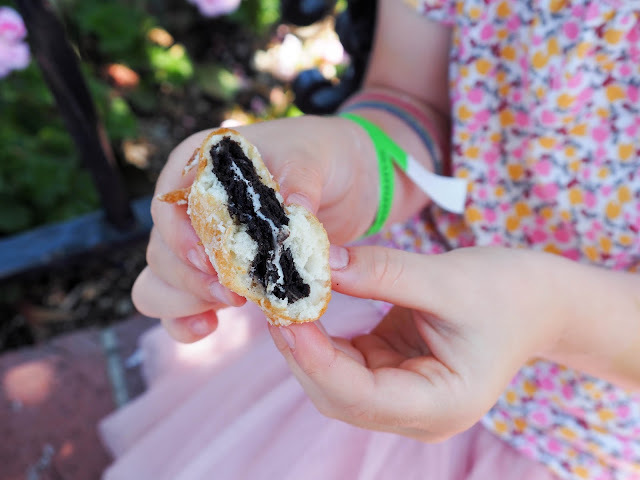 Deep fried Oreos! Can you believe it? Surprisingly, an Oreo dipped in batter, fried and sprinkled with powdered sugar is actually pretty tasty - although I'm not sure I'd want to eat them very often! My girls are big Peanuts fans so they were pretty excited about Planet Snoopy and the rides featuring their favorite characters. 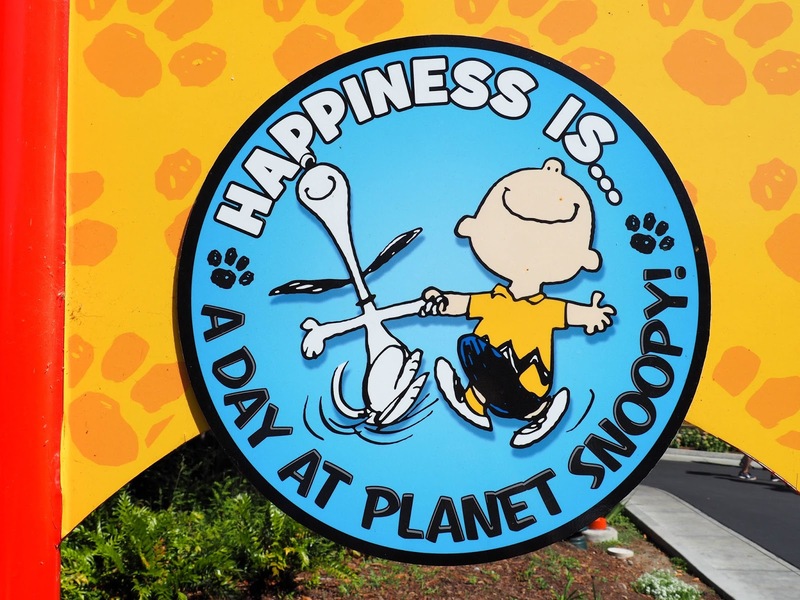 Most of the rides in Planet Snoopy are scaled down, slower versions of more thrilling rides in the rest of the park. 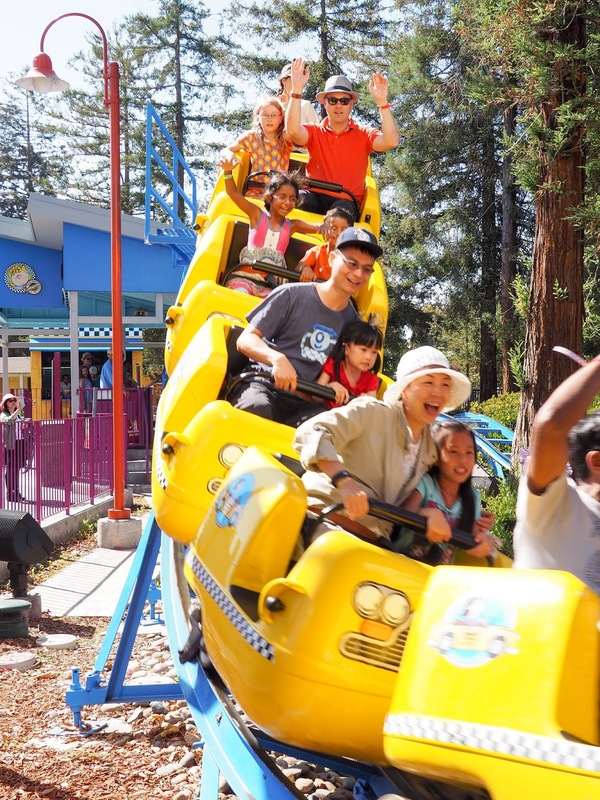 There's a small roller coaster, a mini drop ride, toddler sized bumper cars, a kid sized swing ride and many more. 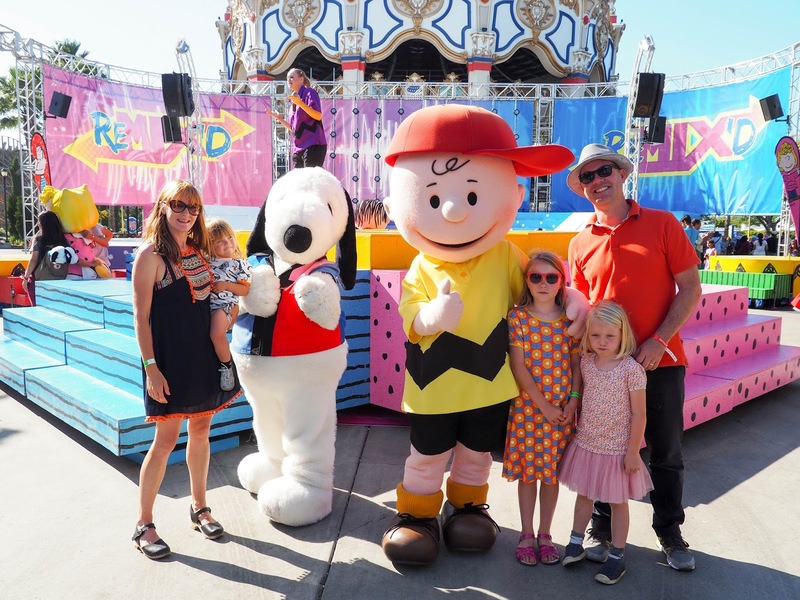 Peanuts characters are also available for meet and greet with visitors - although to Mathilde, this part was more terrifying than even the fastest ride! 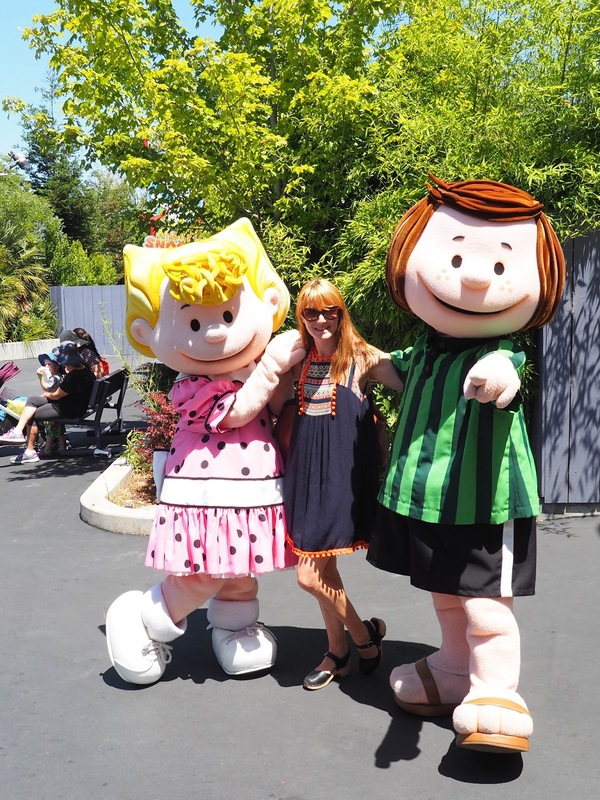 Well, she did like meeting Snoopy and Charlie Brown (but only when he was with Snoopy), but she was terrified of the others, especially Peppermint Patty who was the first character that we met. 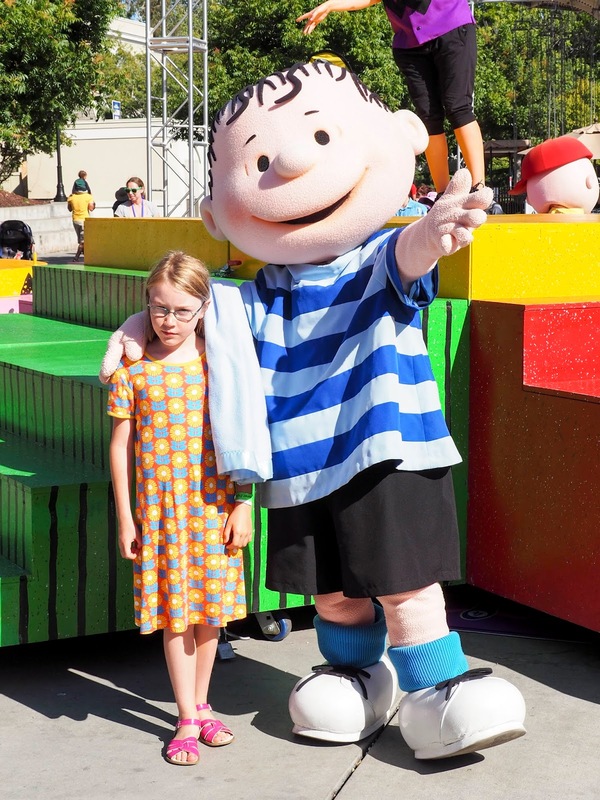 It didn't help that Ava and Lola refused to go near Peppermint Patty either. So I had to step up and have a photo with her to show that she wasn't so scary after all. Mathilde wasn't convinced! 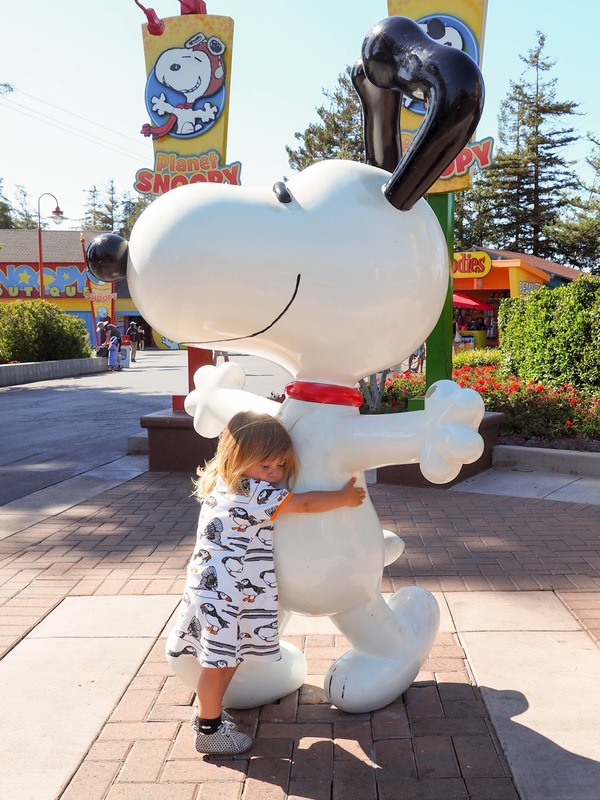 She was much happier posing with a nearby Snoopy statue, although as you can see, she made sure to keep her eye on Peppermint Patty who was just off camera - just in case! A nearby Snoopy picture was much more to Mathilde's liking and while posing she decided to show everyone that she just happened to be wearing Snoopy underpants too! 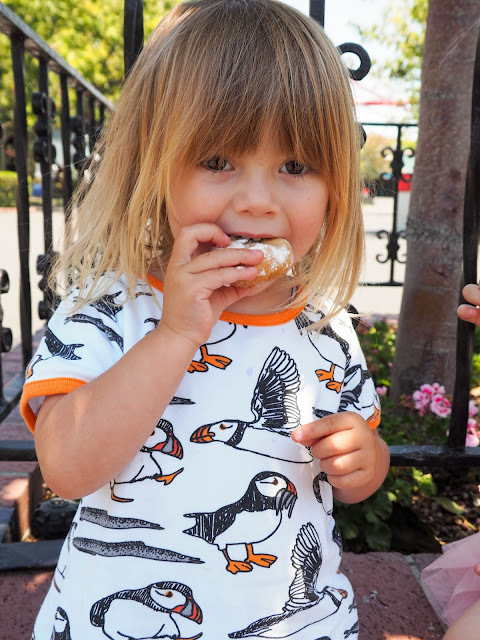 I should point out that this was actually a complete coincidence - just in case you're thinking I coordinate my kids' underwear with places they're visiting! We then moved onto rides including the Peanuts Pirates, Snoopy's Space Buggies and the Flying Ace. The Peanuts Pirates was a little fast for Mathilde so she gave this one a miss while her big sisters rode with Daddy. 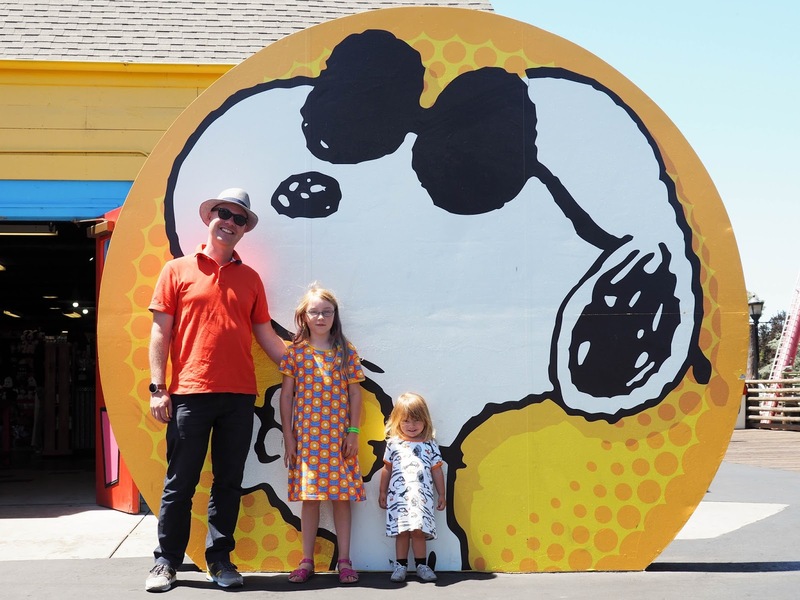 Both Snoopy's Space Buggies and the Flying Ace were fine for her to go on with me though. Kim then took Ava and Lola on the Kite Eating Tree, a mini drop ride. 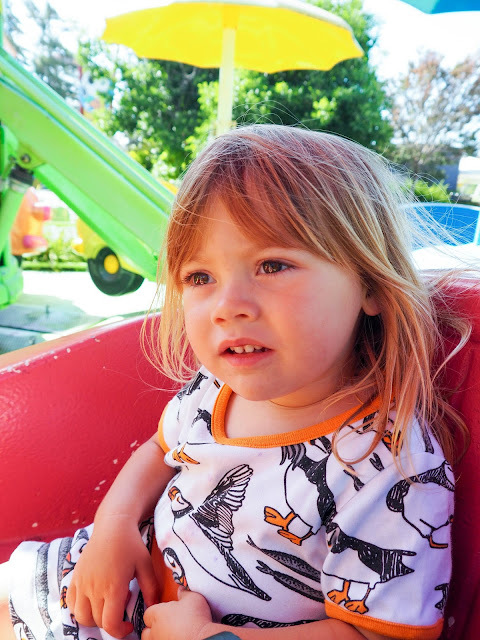 Lola was a little terrified at first as she'd seen how fast the larger drop ride drops and how abruptly it stops, but after watching some other children on the Kite Eating Tree ride she realized it wasn't so bad. She still screamed like crazy though! She has since tried to convince us that the person screaming in the video below is actually Ava, but no one believes her. Ha! 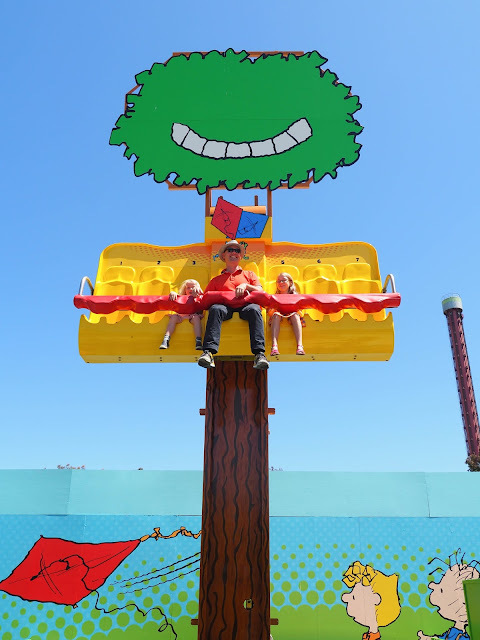 We then took turns on my favorite ride of the day, which fittingly, bares my name: Sally's Swing Set. 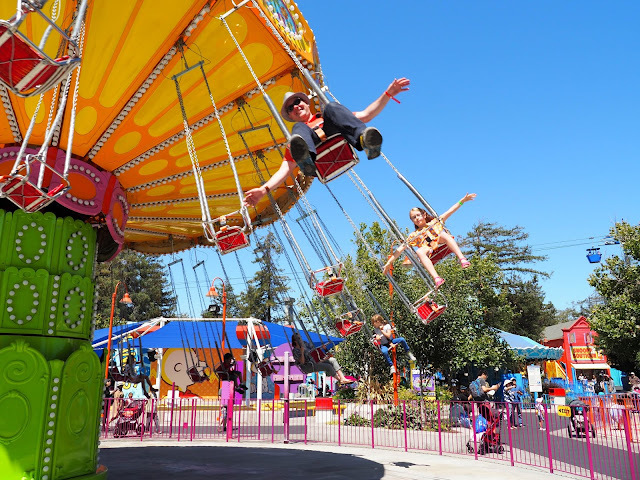 These swing set rides are always my favorite to see at carnivals and amusement parks but I'd never actually gone on one until our visit to California's Great America. Now that I've been on one I can safely say that not only are they the prettiest ride to look at, they're the most amazing to ride. I loved how smoothly the swings fly around. 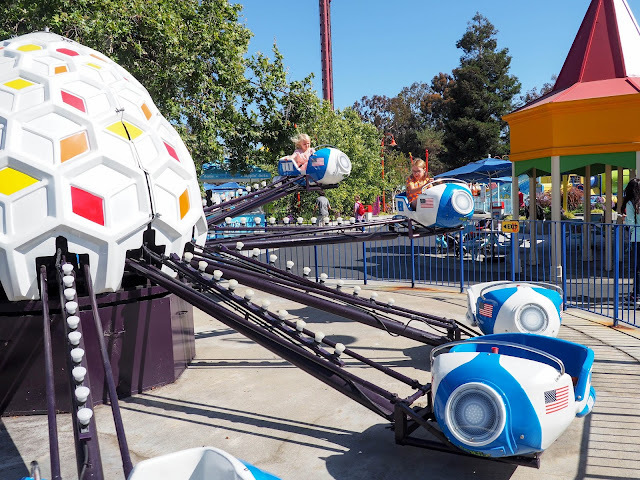 I could've stayed on this ride all day. Well, not quite, but it was definitely my favorite. Lola was a little scared of how how high the swings were so she gave it a miss. Mathilde was keen to have a go but didn't meet the height requirements. After we finished on the swing ride, more Peanuts characters appeared for photo opportunities. One of them was Peppermint Patty again so Mathilde was quite freaked out. 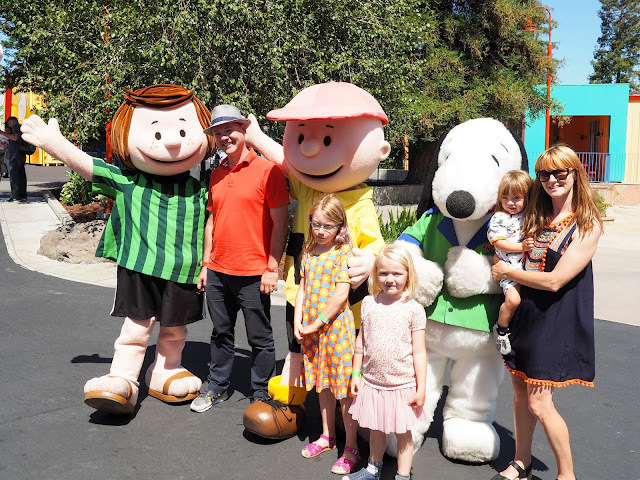 She was happy to give Snoopy a little cuddle, and gave Charlie Brown a high five, but the whole time she had a watchful eye on Peppermint Patty. 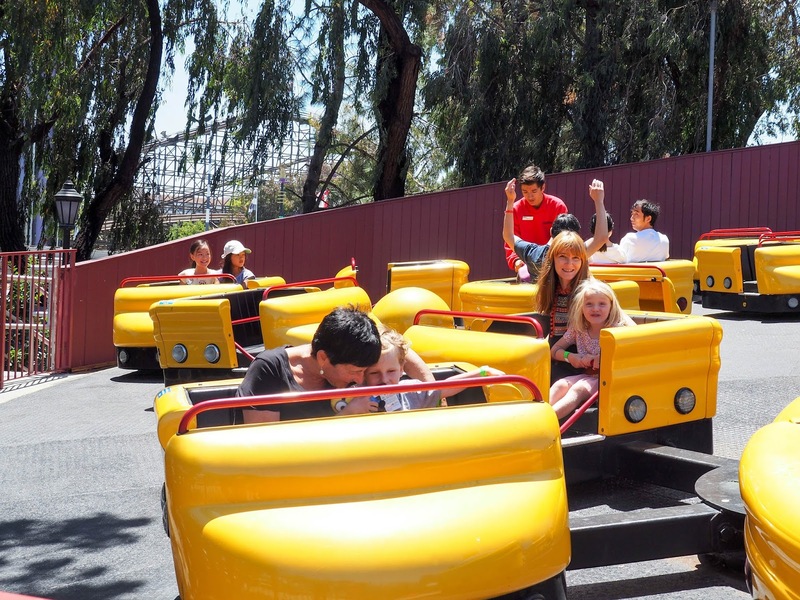 Kim and Ava then rode the Woodstock Express roller coaster, but once again Lola was a little frightened to join them. In fact, at first Ava vowed that she wouldn't ride it (her memories of Disneyland's Thunder Mountain, or Thunder of Fear as she calls it, were still fresh in her mind from four years earlier) but once she saw how small it was she changed her mind. You'll notice that in the first photo Kim is wearing a hat and that in the second he isn't. His hat didn't even make it past the first corner before flying off! Luckily it flew straight into the hands of the person seated behind him - unlike all of the hats scattered on the ground! Ava and Lola then practiced their driving in Joe Cool's Dodgem School. 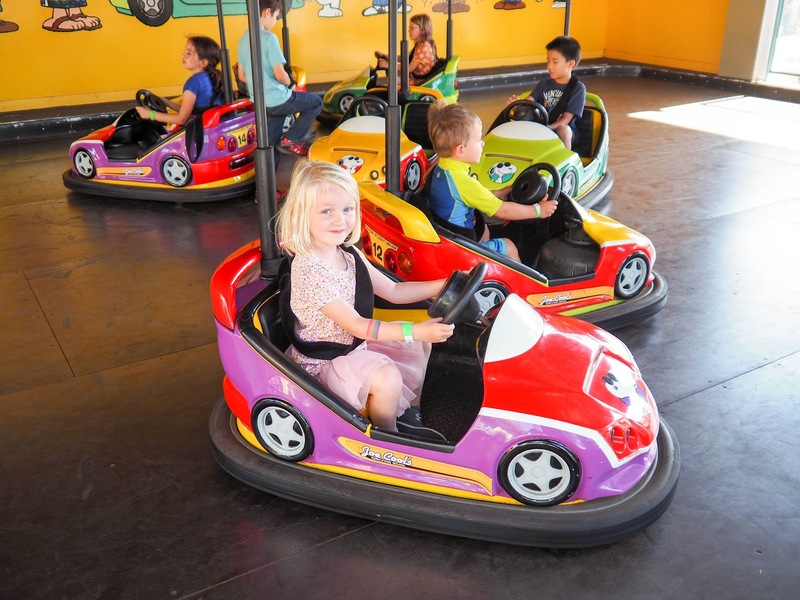 Lola proudly told everyone that she knew how to drive as she had earned her driver's licence at Legoland last Winter break. Not sure I'd trust her driving skills though! 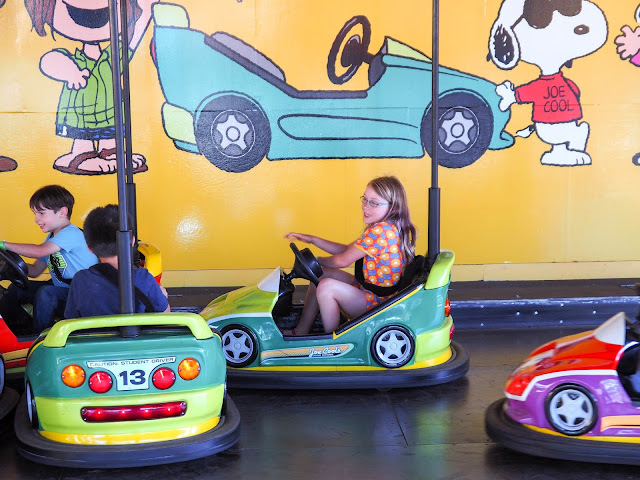 From the dodgem cars the girls headed to outer space with Snoopy's Space Race. 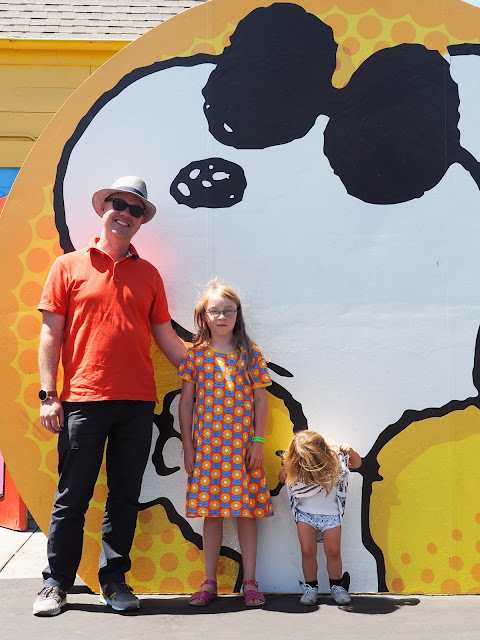 Mathilde decided to ride with Ava this time but before the ride started she changed her mind so I took her out. Just thought I'd better point that out in case you're wondering where she disappeared to in the second photo below! 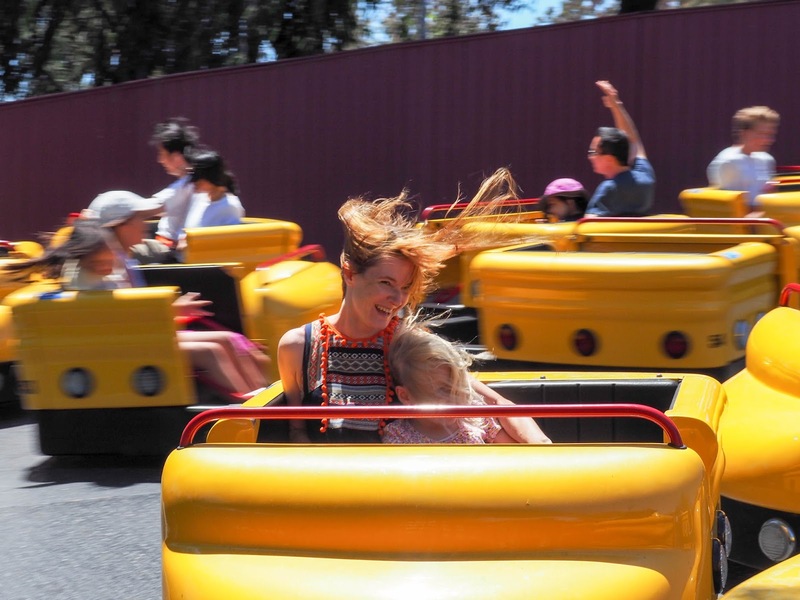 No, she didn't fall out mid-ride. Eek! Mathilde was happy to ride Sally's Love Buggies though, even if she looks a little worried in the photo below. As long as I was right next to her she was happy. 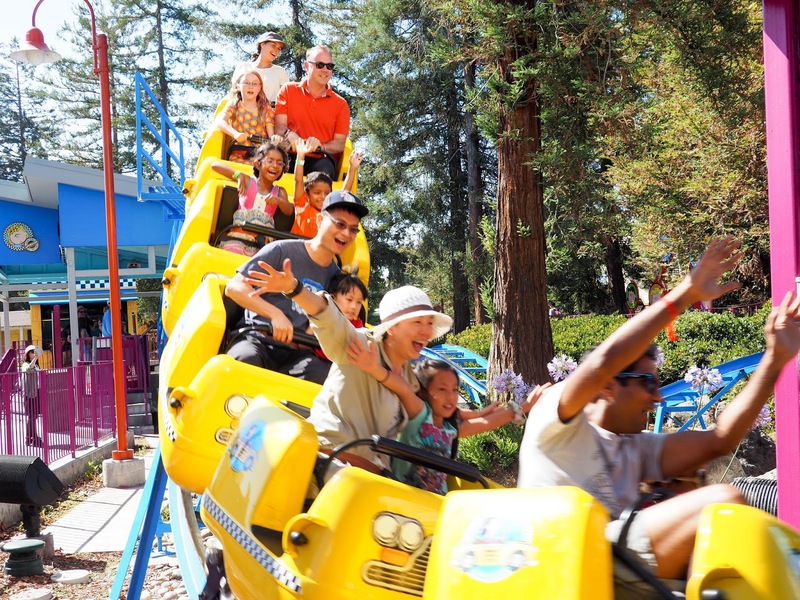 Our day at California's Great America was coming to an end but first we wanted to check out a few of the bigger rides. 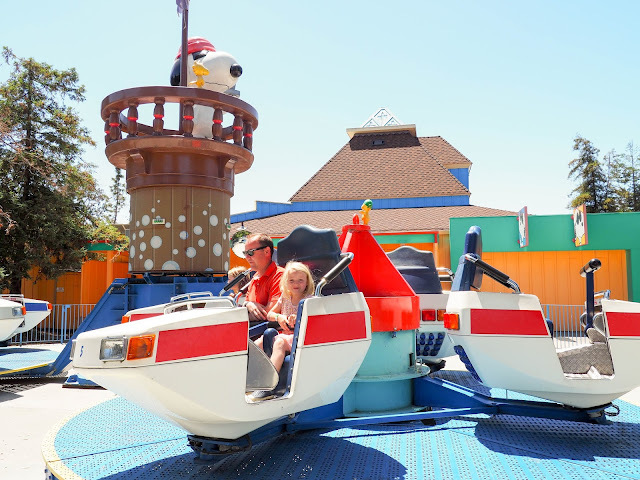 Just outside of Planet Snoopy we came across the Centifuge which we took turns in riding. 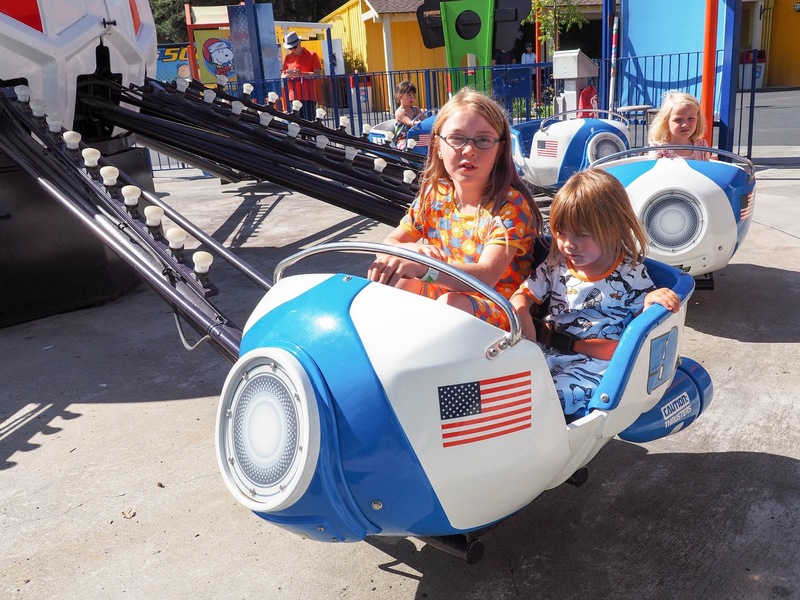 Even though it spun pretty fast both Ava and Lola enjoyed this ride. 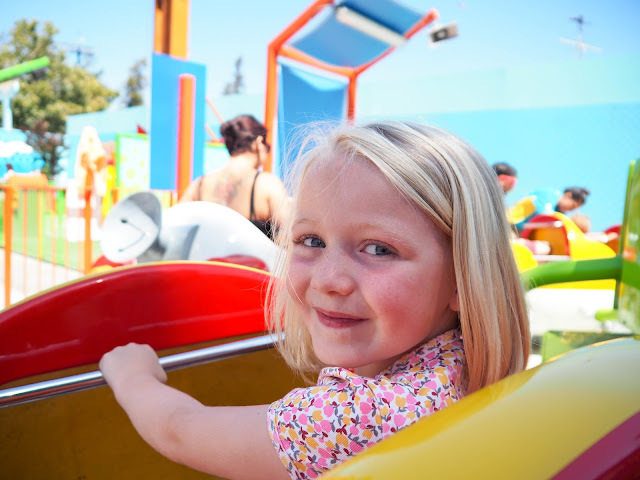 We then hopped back on the Delta Flyer and made our way back towards the entrance where Kim and Ava had a go on the regular size dodgem cars. 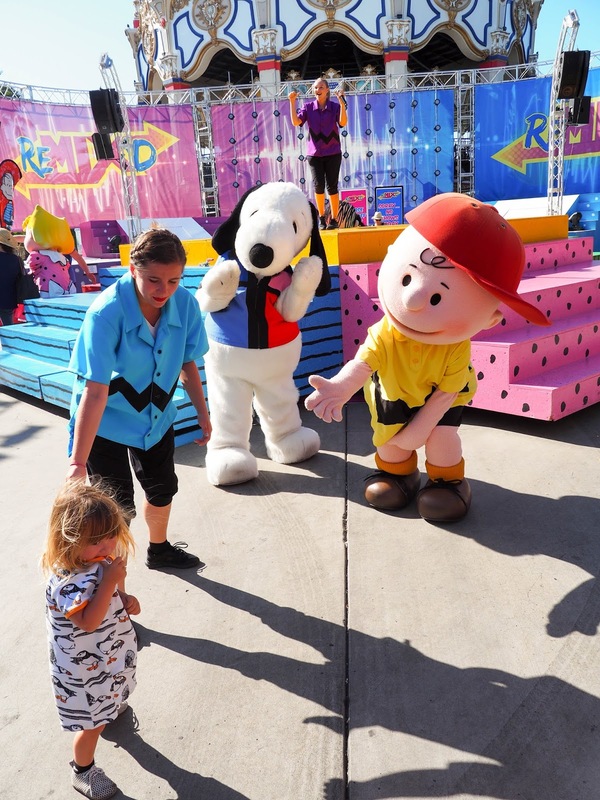 At the end of the day there was a performance and meet and greet with all of the Peanuts characters. Mathilde was still too scared to meet any of them other than Snoopy, but Ava was happy to pose for photos. 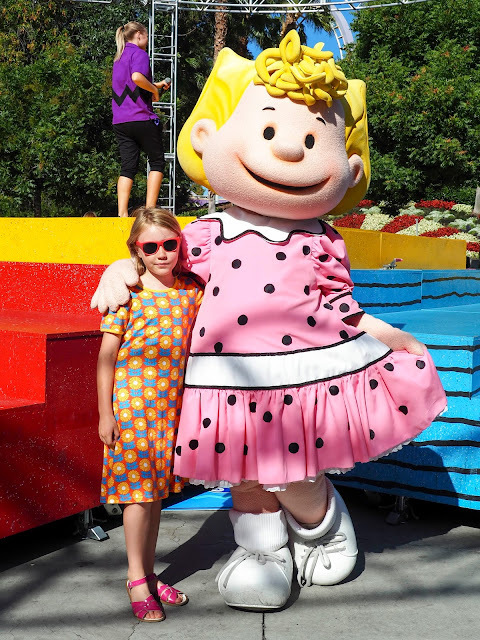 Lola was grumpy about candy (or something) so she hung back and wouldn't meet the characters either. 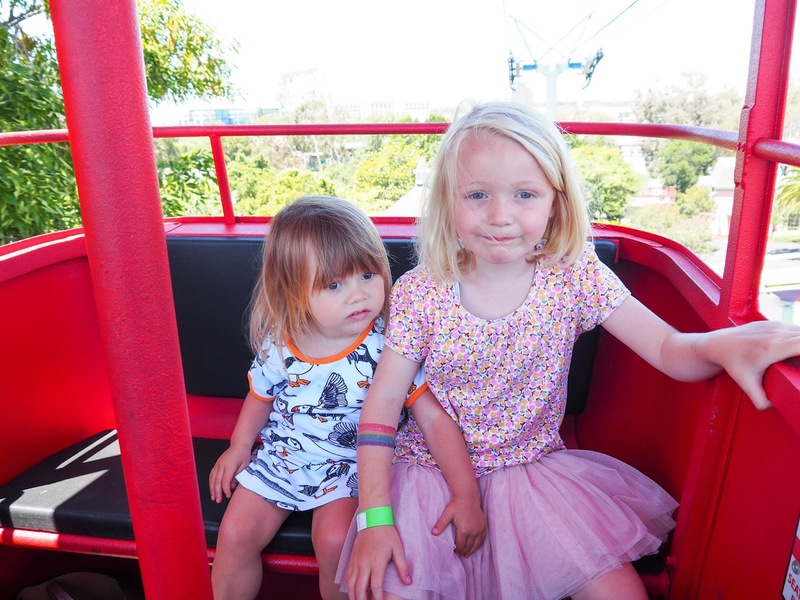 The girls had such a fun time at California's Great America that they're keen to go back and go on more rides. 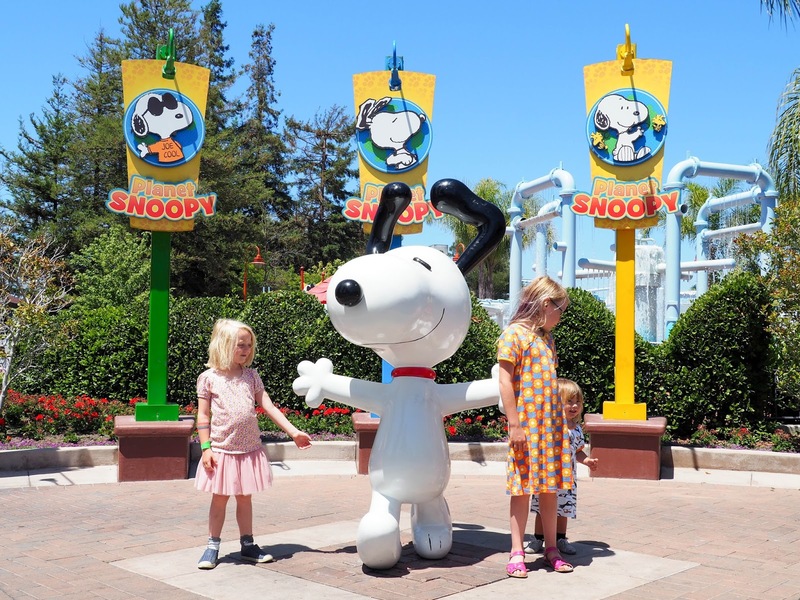 Maybe we can convince them to go on a few of the bigger rides outside of Planet Snoopy. We had hoped to spend time in Boomerang Bay Water Park during our visit but we ran out of time, so it would be fun to go back and check that out too. 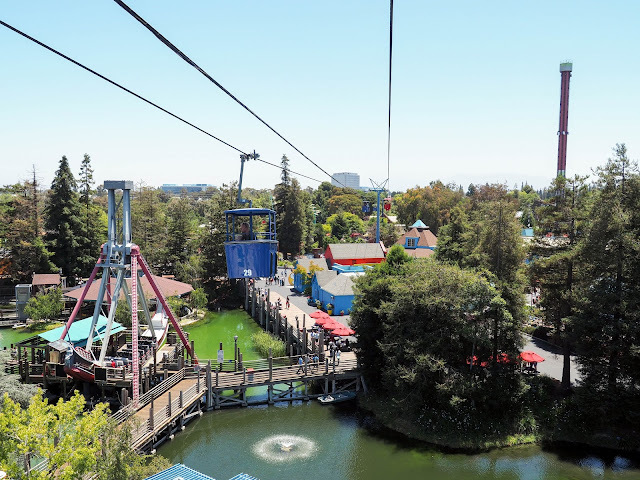 You can find out more about California's Great America here. 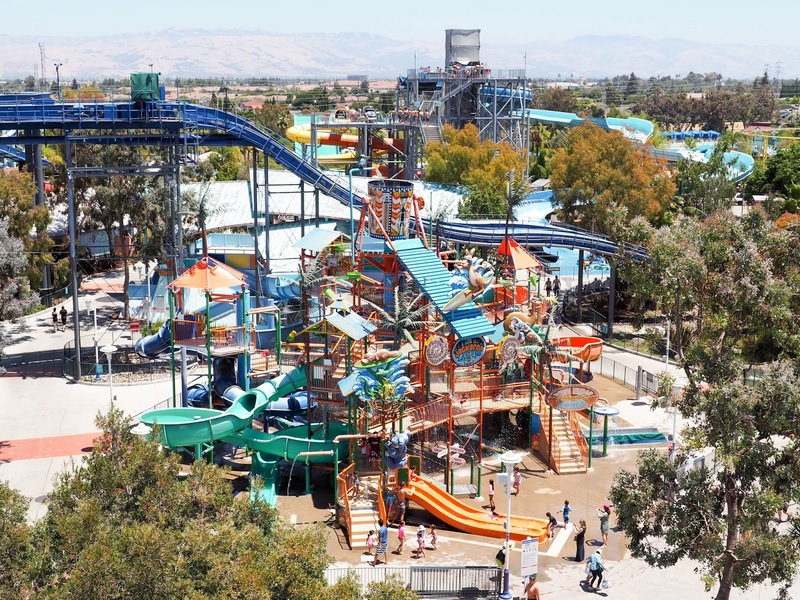 Have you been to California's Great America before? What are your favorite rides? Are there other amusement parks you love that we should visit? I'd love to hear.